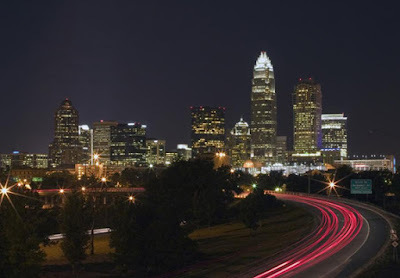 If you're new to Charlotte, it won't take you long to realize that this is a bank town. We're the number two financial city in terms of assets, second only to New York. Most of this is due to Bank of America and Wachovia being headquartered here. You likely know the story of how the two banks employ about 35,000 people in the area. But did you know that more than 80,000 people are employed locally in the finance industry as a whole? Not only is about half of that number bank employees, but the other half are jobs that are created largely because of the banks' presence: insurance, investments, mortgage lenders, etc. So with the ongoing bad news about the banks' financial state, I'm concerned. In the last two weeks, Bank of America has reported that its first quarter earnings fell 77 percent, while Wachovia reported that it lost $393 million during the first quarter of this year. And in the past week, both banks have coincidentally received big fines or penalties for having programs that violated SEC laws. When companies are losing hundreds of millions of dollars, people are soon to follow. I'm concerned that if things don't turn around soon, the banks will be forced to conduct big layoffs (some have already been announced in recent months). And when people get laid off, they often move away in search of new jobs, especially if they moved here because of the job in the first place. I'm afraid that would mean scores of young ladies would be leaving Charlotte. In late 2005, about four months after I moved to Charlotte, I was working on an article on speed dating. As part of the research, I attended two different speed dating events. I didn't go as a journalist. I went as a "regular" person, so I signed up and attended like everyone else. One of the speed dating events I enjoyed more than the other. In that particular one, what I remember most was that about half of the dozen or so women I "dated" that night (each date lasted 5 minutes) worked for either Bank of America or Wachovia. I learned this because one of the standard questions you ask or are asked during you five-minute interview—because that's what it felt like, an interview, but it was fun—is where do you work. Since that time, as I've gotten to know Charlotte—its people and places—better, I've come to realize how much the banks mean to this city. I'm not going to go on and on about the jobs they create, the philanthropy they do, or their overall impact (BofA and Wachovia are singlehandedly responsible for the growth and development downtown has experienced). I only care about the ladies we could potentially lose. What would the nightclubs and after-work social scene be like without the chicks from the red and blue banks? The young professional women who line the bars and meet in groups. I don't even want to think about it. I was actually one of your "speed dates". I remember you went for the "stretch and yawn" to put your arm around me before the salad even arrived.